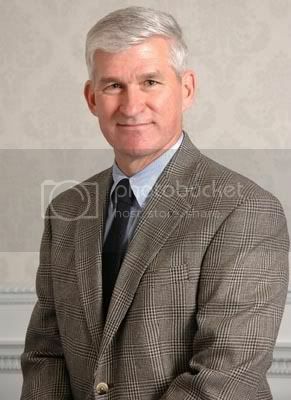 Andrew J. Bacevich is a professor of international relations and history at Boston University. Bacevich spoke at IU on Wednesday on the topic of "U.S. Foreign Policy After Iraq." Thursday morning, I had the privilege of having breakfast with Bacevich and a group of my fellow grad students. Bacevich has written several books on U.S. military policy, but he's best known for his numerous articles and op-eds advocating for conservative militarism while denouncing the Iraq war as wrongheaded and pointless. Most recently, Bacevich endorsed Obama, and in the American Conservative, no less, which took a lot of guts (h/t Ralph Luker). Unfortunately, I didn't get to ask him about that. Generally, one doesn't think of columnists as being engaging speakers, so I was pleasantly surprised when Bacevich proved the exception to the rule. He held forth for about forty-five minutes before a crowd of about 200 people, packed into a room that seated about 75. Bacevich's main argument was that in the aftermath of 9/11, the administration had developed what he termed the "freedom agenda," which rested on three assumptions: that American military power was invincible, that the greater Middle East was ripe for transformation, and that it was possible for Americans to instill democracy in the region at a minimal cost. Subsequent events, of course, have proved all three of these assumptions wrong. Today, Bacevich argued, America's military and foreign policy strategy has failed -- and worse, the Bush Administration has no comprehensive, moral strategy to replace it. After his talk was finished, Bacevich entertained questions from the audience for about thirty minutes. Two responses were particularly notable. In response to a question regarding America's moral obligation to the Iraqis we've displaced, Bacevich grew heated and stated that the only way to truly fulfill this obligation was to bring the roughly two million displaced Iraqis to the US as refugees, or at least to finance their rebuilding efforts much more than we are now. Since Americans aren't willing to do that, Bacevich spluttered, they shouldn't put the burden of that obligation of the troops who can't do anything for those people and are dying anyway. (Presumably the question raised the specter of Bacevich's son, who was killed in action last May.) Another questioner, an elderly professor of Arabic who's been teaching at IU for over forty years, movingly lamented that Bacevich hadn't mentioned the role of American cultural hegemony in failing to understand the underlying motivations of radical Islamists. Bacevich's reply was surprisingly curt and can best be summed up as: yes, Americans are narrow-minded and parochial; no, we can't change that, so we should just deal with it. Owing to a location mix-up, I arrived late at the breakfast Thursday morning, and apparently missed a rather heated exchange between Bacevich and another grad student, who is a strong pacifist. The student had arrived early to reiterate the Arabic professor's concerns about Bacevich's deemphasis on cultural causes of the current conflict, and Bacevich seemed to be unmoved by her comments, as he poked fun at her beliefs at regular intervals throughout the rest of the breakfast. By the time I arrived, Bacevich was on to his next topic, a passionate ode to Berlin which he delivered to the two German students in the room. Eventually, this topic subsided as well, and I got to ask Bacevich a few questions. My first question considered Bacevich's critique of Wilsonianism -- he'd called President Bush a "born-again Wilsonian" in his speech. Longtime readers are aware of my rather quixotic revisionist views on Woodrow Wilson and my insistence that Bush's foreign policy is aggressively anti-Wilsonian. To his great credit, Bacevich let me say my piece before vehemently disagreeing with me (which I certainly expected). The gist of his argument was that Bush has articulated moral principles no less ringing and coherent than did Wilson; specifically, he pointed me to this speech as an example. My second question concerned Bacevich's prolific op-ed writings, or what he termed "ephemera." I told him I admired his productivity in that regard (which I do) and asked him how he balances ephemera, scholarly works, and a personal life. His basic answer was that he doesn't, and that it's not possible to do all these things well at the same time. Bacevich said he could write so many op-eds only because his kids were grown and gone and because his books are not very scholarly in nature -- i.e., they don't involve much research. My final question elicited perhaps the most interesting, and surprising, respnonse. At ZenPundit's request, I asked Bacevich what he thought our future defense spending priorities should be. His response was that we should focus on beefing up our navy, and secondarily on maintaining our air superiority, while cutting budgets for the army and marines. For those of you who read this blog, that's suggesting a combined 2GW/3GW force to meet a 4GW threat -- a clear no-no in strategic theory. When one of my fellow grad students pressed Bacevich on the navy question, he admitted to being a Mahanian and said we needed a strong navy to deter pirates! Like most people, Professor Bacevich is a mixed bag. Notwithstanding his somewhat quizzical fear of pirates and his brushoff treatment of my pacifist colleague, I found Bacevich to be an engaging and intelligent speaker with a lot to say on our current state of affairs in the Middle East. He was nothing but kind and considerate to me, and I learned a lot from my exposure to him. So interesting to hear what a meeting with Bacevich was like! I have assigned portions of The New American Militarism in undergrad history classes and have found that students are very responsive. His reaction to your pacifist classmate isn't surprising. I continue to harbor a healthy respect for the man, despite my disagreements with some of his arguments - we need more liberals to think with as much clarity and honesty as he does. Mralarm, I agree in general with your assessment. He's a very intelligent man with a lot for us to learn from. Not sure I'd characterize him as a liberal though -- in fact, he might take umbrage at that characterization. He described himself in the talk as "culturally conservative." A new aspect. A little politically challenging from an older person. "Another questioner, an elderly professor of Arabic who's been teaching at IU for over forty years, movingly lamented that Bacevich hadn't mentioned the role of American cultural hegemony in failing to understand the underlying motivations of radical Islamists. Bacevich's reply was surprisingly curt and can best be summed up as: yes, Americans are narrow-minded and parochial; no, we can't change that, so we should just deal with it." Many nations, or post colonial hodge podge groupings have been entangled in acts of genocidal proportions, internally and externally for historically long periods. It was a lucky moment to find Adenauers, Erhardts, and Brandts to lead the Germans. Hungary head one single Deak as one enlightened leader in the whole just over 1000 years. The Arab nations have not generated one Deak yet. The old Arab lecturer/professor, Bacevich, and we all should figure out how Deaks (or similar ones) can be brought to leadership in the Arab nations to replace the tyrants and kings. So far, not one Arab nation has got a gifted honest and constructive leadership. Thanks again for relaying my question Jeremy, Bacevich's answer was eye opening. I too would not characterize him as "liberal" either. More of an "anti-neocon" than anything else. I know Prof. Bacevich mainly through his son Lt. Bacevich who was a friend of mine prior to his death in Iraq. However, I admire his writings and am often made very uncomfortable when I find myself disagreeing with him. There is one thing that you must know about this modern King Priam, he despises dogmatic or ideoligic "thinkers". That is probably why your pacifist friend fell afoul of him. Matthew, I'm very sorry for your loss; from all I've heard, Lt. Bacevich was a very fine man. As for his father, I agree with you for the most part. While I was rather shocked by his comment on enlarging the navy, I was very impressed with him in general. The man commands a lot of respect, and it's well deserved. I think his comment about increasing the Navy is a bit of a cat's paw. His big point is the "either less wars or more warriors" question. He sees an increase in naval and air-power as a way of maintaining American Power overseas while drawing away from military commitments. What he is truly after, if my read is correct, is either a military that is much better integrated into society or else an end to long term deployments. Naval power as expressed by Mahan is a means to that end (ie. instead of having to controll the sand from whence the oil is pumped, controll the water over which it is shipped). I am not sure I agree with his naval plan nor am I sure that he is in earnest about it. Though ideas like this will grow on him over time. As far as his point about society being alienated from the military, I cannot agree more. I am a Harvard man myself and have spent some time in Harvards Memorial Hall. It is shocking to see how many Harvard men fell in the civil war, WWI and WWII and then how few have died in battle since. That is because so few of my fellow Harvard men have served since. I was one of three veterans in my graduating class. There were more foreign veterans the class of 2005 than US vets. However, the graduates from our alma maters go on to be our "ruling class" (I know the term is impressice so I ask pardon in advance)without serving in the army, having friends in the service, having brothers or fathers who have served and who would react with horror to the suggestion that their children serve. That is what truly irritates Prof. Bacevich I think. We as a society needs to decide if we are willing to bear the burdens being a miltiary society if not, then we need to more or less discard warfighting as a tool of statecraft, if so then the burden needs to be shared across class and geographic lines lest it become a "Rich man's war, Poor man's fight.